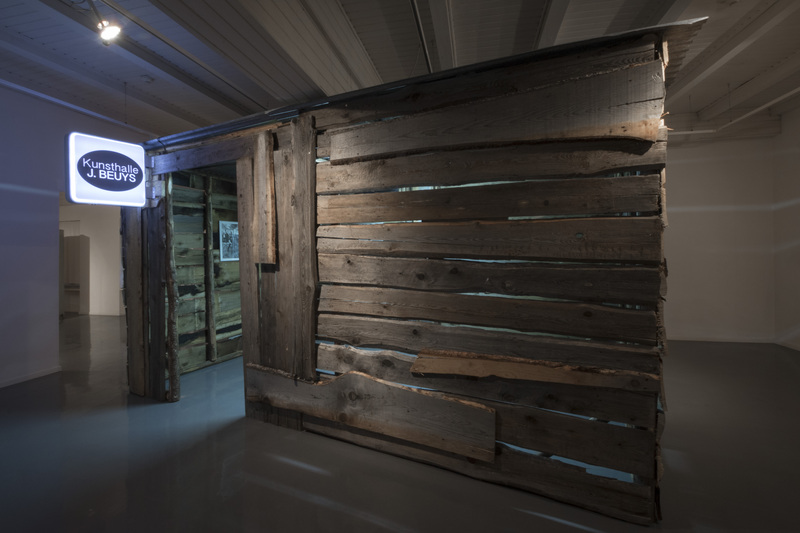 Like Heidegger’s “Hütte”, far from the city crowd, Egger’s “Kunsthalle Beuys” contains photos and portraits of Beuys by Buby Durini. Beuys’s propaganda machine was exceptional. Posters and photos accompanied his art output, especially the Operation “Difesa della natura”. His aim was to influence society and he saw creativity as man’s precious and unique capital. The roof bears the illuminated sign Kunsthalle Beuys, in marked contrast to the chalet itself which is made out of scrap wood.